The CTB-1127 MS Passenger Car is a short (24 studs) four axle piece of rolling stock. The “MS” nomenclature came about due to the fact that many of the elements needed to build this car are not readily available unless you have access to parts in one of the LEGO Model Shops. CTB-1127 was also dubbed the “Cotton Candy Car” by Steve Barile and Ben Fleskes when I brought them out to Portland for a visit to the PNLTC Mall Exhibition in the Summer of 2002. 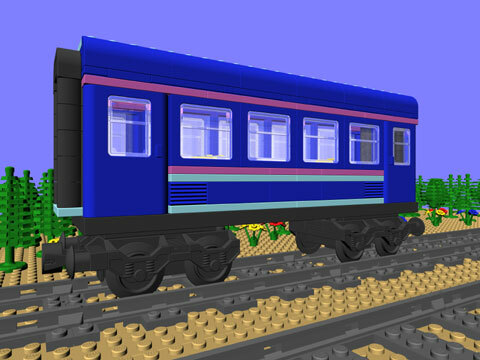 This model uses a number of pieces which may be hard to find, notably the pink 1×2 and 1×6 plates, the Maersk Blue 2×4 and 1×8 plates, and the rare blue 2x4x1 1/3 brick with curved top. While these elements may not be readily available, you may be able to find them on BrickLink. Printed and bound instructions for CTB-1127 are available for purchase on Bricklink.